Welcome to our Reader's Gallery. This is your page. If you have made one of our garments and would like to send a picture or just want to tell us about what you've done with our garments, we'll be happy to feature you on our gallery pages. Send us a photograph of your garment via "snail mail", or if you have the capability, you can email the image to us. If you "snail mail" the photograph to us, let us know if you want it back. If you can't provide us with a photograph, just tell us about your garment and wel'll feature it anyway! 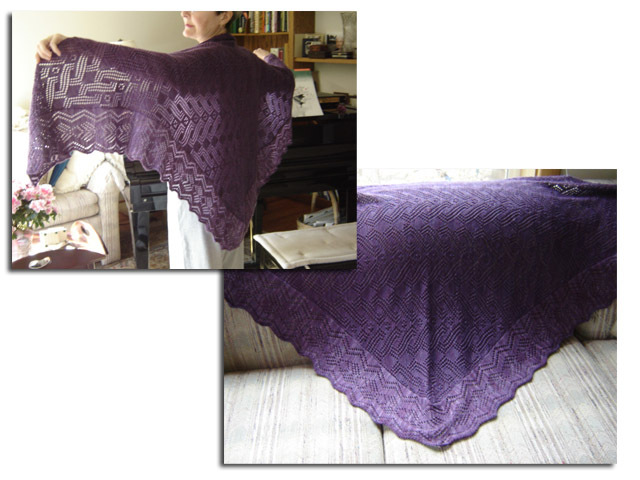 This is the Patience shawl by Mar Heck, from No 32. I met you during the San Francisco trip you made last November. This was my second big project, first being Take a Turn. I thought a big lacework project like this was beyond me at my stage in learning to machine knit, after going to the seminar in November, and seeing some of the lace sweaters you brought with you, I decided to give it a try. It turned out wonderfully. Lots of credit to Mar for her great instructions, and to you for putting out such a wonderful magazine. 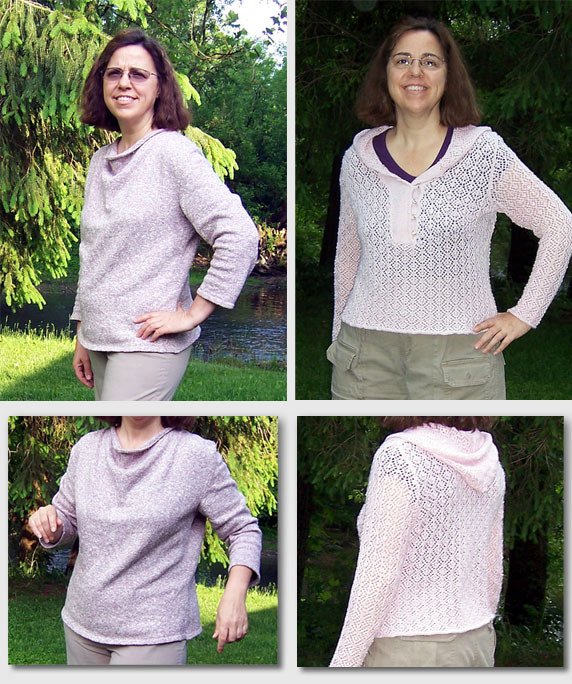 After I saw this sweater, Frill Ride, from issue 52, at a seminar I decided to make it. I did it on my Passap DM80 and am really happy with it.I did it with a cone of Wool ray that I had waiting for the right project. But it really took seeing it in person at a seminar to realize how great it looks on everyone! Thanks so much for your great magazine! 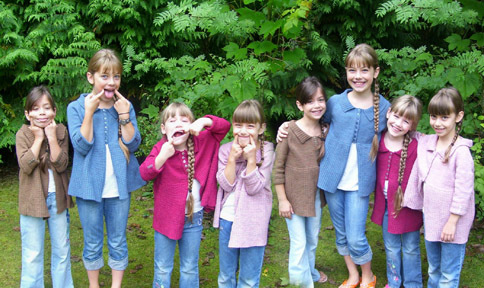 I have just recently finished knitting my three gorgeous granddaughters a Princess Rag (No 50) cardigan each. 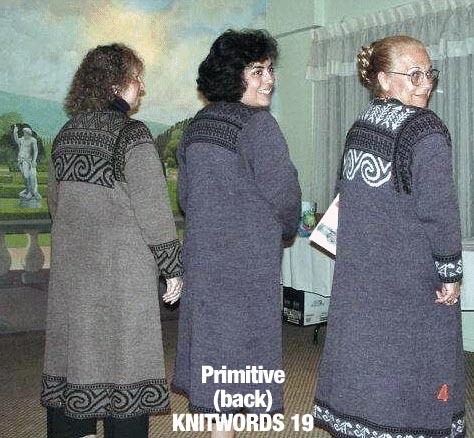 I knitted them in Forsell‘s Shamal yarn which I had in my stash instead of the suggested yarn. Nonetheless they have turned out very well and I am very pleased with them. Here is my 'Faded Favour' from No 39. I used Bonita cotton. The shoulder fit is very good. The ribbing is looser than Jack (my hub) would like; he said "Can you bring this in? ", I said "No." He said "Ok." The tone of the conversation was marriage-speak for "we will never speak of this again". Actually got stitch and row gauge to the pattern; amazing. Thanks for the help on the seaming; way better than Groovy as well as way faster. Just finished 'Back to School' sweaters for the rest of the girls - 'Buttoned Down' (#50), (to match Hannah's - blue) all in Tamm Varsity. I did all the garter carriage work first, taking the pieces off on waste yarn or garter bars, depending. Then rehung and finished them off - it went fairly fast. It was fun choosing the different types of buttons to vary the look a bit. 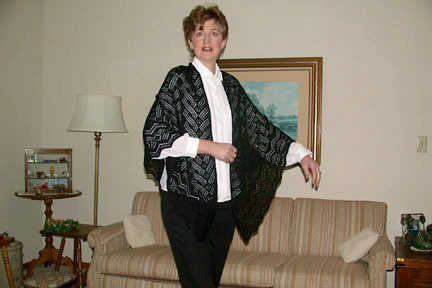 Hi, Maryanne, I'm attaching a picture of the garment inspired by Mazatlan. I couldn't match your stitch pattern on the Brother machine, so made up my own. And of course, since I wasn't using the yarn in the pattern, I had to figure out my own tension, rows, stitches, etc. DAK helped with that. Then I couldn't get the trim to work, so used the trim from Nougat, issue 49. The end result isn't anything like the pattern you designed, but you gave me a starting place! And you inspired me to look elsewhere for the solutions. Patterns aren't cast in concrete but can be used as inspiration for my own creativity. Thanks! 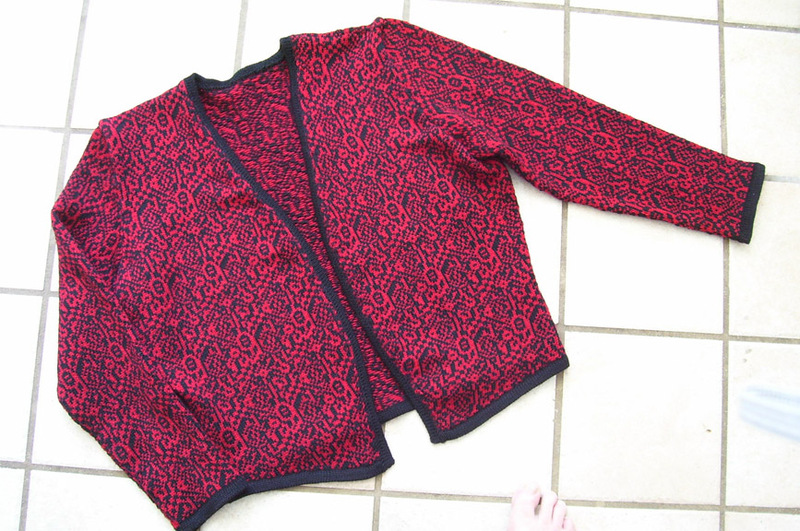 Hi, Maryanne, here's my first legitimate attempt at making a garment directly from Knitwords. I thought I had the gauge correct, but I guess I was too optimistic and stretched where it should have rested. Anyway, I'm pleased with the look of the garment and am all set to make it again with another yarn. I fiddled a little with the ribber tensions, as I had trouble with the band at the tensions you suggested. End result is quite nice. The button is made from polymer clay with a metallic glaze and resin finish. My version of your granddaughter's dress from No 47, for my goddaughter in France. It may not be perfect – but I MADE IT!!! Thanks Mary Anne!!! Now for my Gin and Tonic!!!!! Print It from No 46, using Bendigo Woollen Mills yarn for the first time from Australia. Black and red, one of my favorite color combos and for a first fairisle garment, it's been a challenge, I got it done. I have a new strategy when I have a problem! I wrote you a long e-mail, save it as a draft, sleep on things and then go back to it. So far, I've been able to delete the drafts. How's that for getting independent? 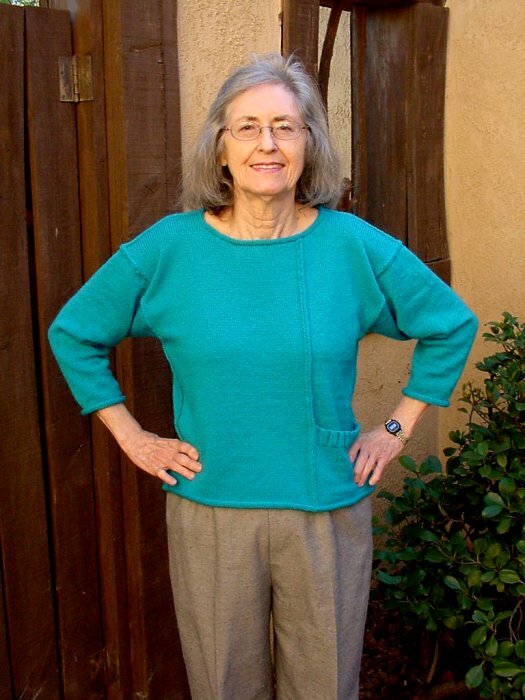 From No 41, I made this sweater just after our club's inspiring workshop with Mary Anne. I used a yarn from my stash - 98% rayon, 2% nylon called Sanibel - and was fortunate to get the same gauge. I struggled with getting all the transfer stitches right in the swatch and then remembered Mary Anne's advice to mark the needles. What a difference that made! It was time consuming to do the cables and faggoted lace, but well worth it. The color of the yarn was so unusual and the texture so glorius, I made simple buttons to match from polymer clay. 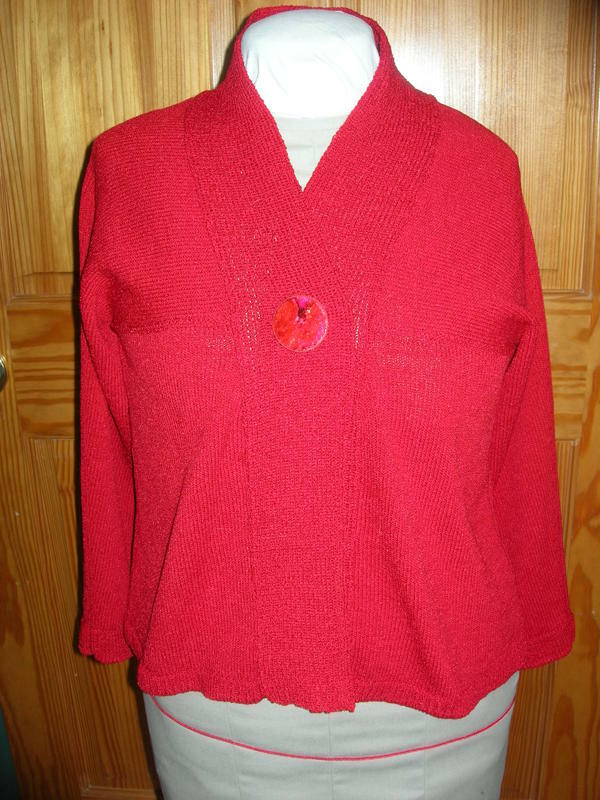 From No 43, this is made from Prime Alpaca and is absolutely lovely and soft. I made the pieces on my LK150 while traveling in our motorhome and washed, blocked and finished it at home. My gauge on this was not quite accurate hence the bands on the sleeves. Also, I didn't get the flair in the back I expected, but I love this sweater. The button is Raku and one I purchased from a local artist a couple of years ago. I love that it is perfect for this sweater, and that I didn't have to make a button hole for it! Hi! 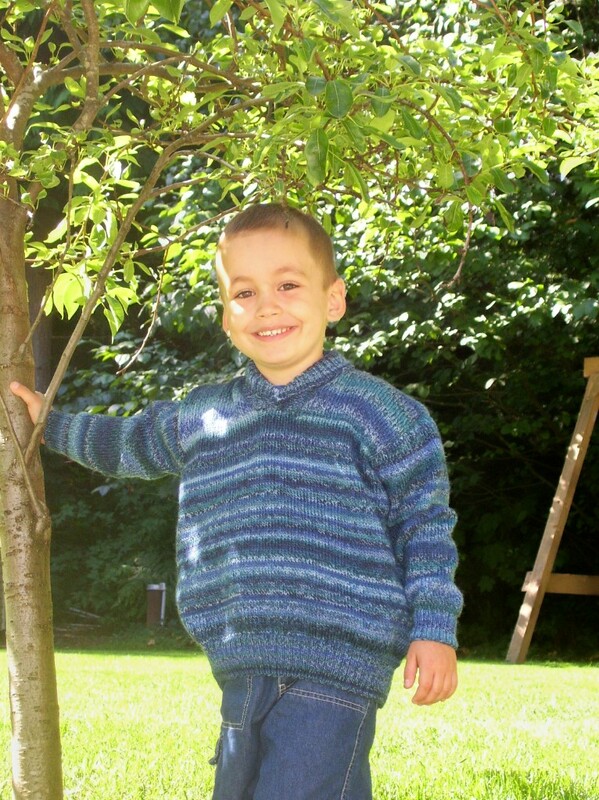 I wanted to thank you for the cute little zippy tweed pattern in Knitwords 34. I've made 7 in various sizes to donate to little kids on the Pine Ridge Reservation in South Dakota. The yarn I used is a mix of acrylic yarns in various sizes that are extras from other project. I kept putting yarns together until I got your gauge. 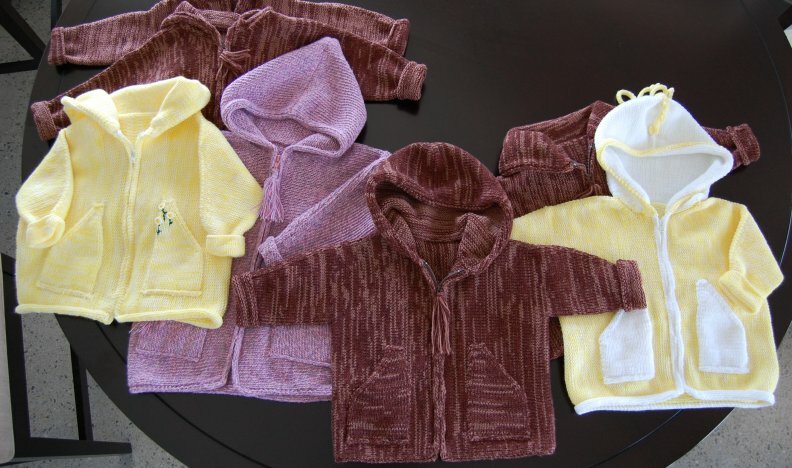 Some of the sweaters are made of 4 or 5 yarns knitted together. 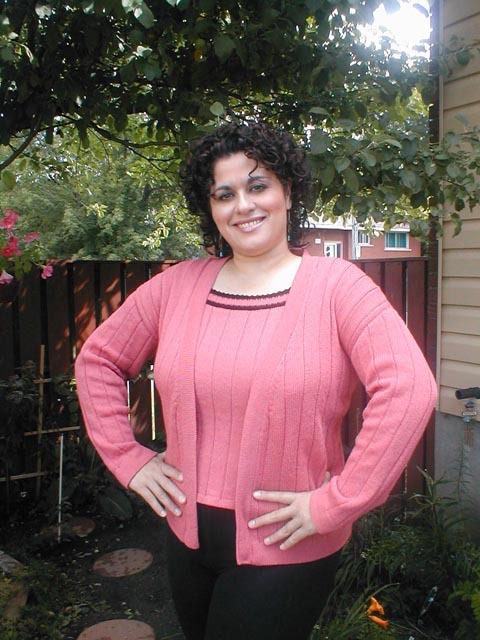 The pink/gray sweater is made from acrylic yarns that I plied on my spinning wheel in order to get a consistent tweed. The other ones are just wound on a cone and knitted as one yarn. I think that the randomness makes them interesting. It was nice to be able to finally use my Studio 860 and to get some of my yarn stash out of my closet and into the world where it might keep some child a bit warmer this winter. Again, thanks for the Nathan ware series. I enjoy your "kid friendly" creations. Lorraine Miller , Edu-taining Dogs ! Hi Mary Anne, I made Margaret Heck's "Edu-taining Dogs" blanket (No 35) in three color jacquard and added the alphabet from her pillow. I will be giving it away as a baby shower gift in a few weeks. I made 'Zigzagged', your cover garment from No 44, with am using Classic Elite Premiere, 50% pima cotton/50% tencel that is the exact same yardage/grams as the wool/silk that you used, on my Brother KX350. Finished it this weeked. I'm really happy with it. 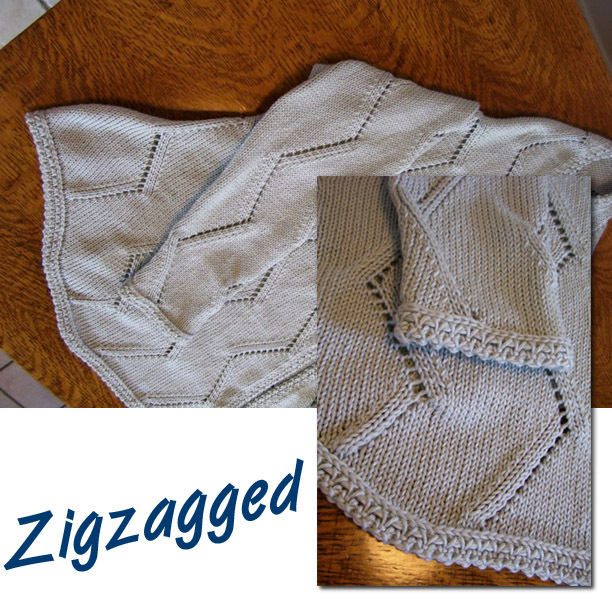 My zigzags didn't line up as well as yours; I think that row gauge came back to bite me a little; had to do some gathering to get the sleeves in. The things I think of after the fact. I didn't shorten or lengthen the sleeves; row gauge took care of it and they are perfect; maybe a tad long, but I prefer that to too short. I took your advice there, thanks. The back stretched out with the weight of the sleeves, so no trouble there either. Now, if I knit it again, it would be perfect! I always think that after every garment. Thanks for the really nice pattern; it really was a fun knit and I think I'll get a lot of wear out of it. I love love love the trim too. So pretty. A big hello from England! My name is Barbara Wood. I have been machine knitting for 29 years. 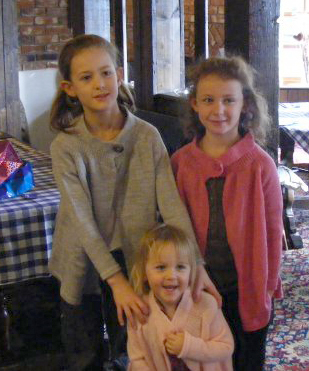 Yes, I started very young! I got my first machine about a month after my 21st birthday. I have sold my knitwear, worked in a machine knitting centre, run clubs and done a bit of teaching over those years. Well, times change and in the last few years work outside the home has taken up more and more of my time. I have always tried to do a bit of knitting, and two years ago I got a computer and the internet and that has opened up a whole new world of machine knitting contact. Last year I came across your fantastic publication, which gets me to the point of this email. I love to knit my own designs, but also knit other peoples. I just loved the top, "Window Dressing", from the last edition. I made it a couple of weeks ago and have enclosed a couple pictures of me wearing it. I made it 20 rows, i.e. 2 repeats shorter as I wanted to wear it with trousers. I love using Yeoman Yarns. I love your magazine, so many lovely things to make and bang up-to-date. Just the magazine I was looking for to keep the enthusiasm going after so many years. Many thanks to all of you for the hard work you put into the magazine. 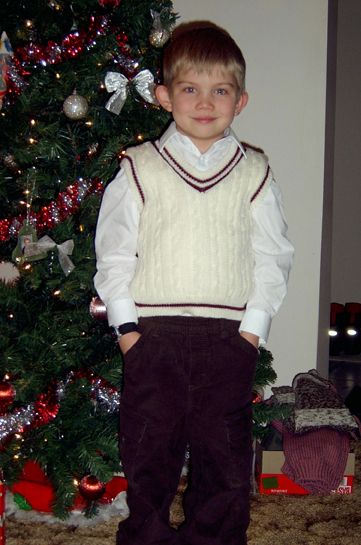 I am sending you a picture of Dawson aged 6 at Christmas 2006 (a nephew) wearing the L'il Sport vest I knitted for him. This is the first time I have made something with the double bed but it is such a nice design I decided to give it a try. I did work out the Cheat Sheet first to show me where to cross the cables. After much trial and error I also mastered the Manual wrap cast-on, I love the way that looks too. I took my time and was delighted with the finished result, as was everyone in the family who was there for the family gathering, 14 in all. I had lots of compliments on it. My husband now wants one the same and I think I am going to make the ladies Vee neck sweater "Vintage Cables" from Issue 36 for myself. Thank you for a wonderful magazine and for inspiring me to stretch my capabilities. It was good to see you again in P.E.I. We all enjoyed the seminar. 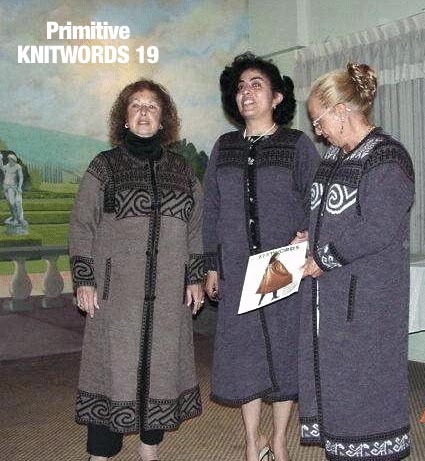 We all received your Knitwords Autumn 2002. My granddaughter enjoys looking for patterns in your mag; she loves the Peasant sweater I knit for her from No 22. Here's myTake A Turn from No 36. I used Forsell's wool as you did and learned a lot! Thanks! Here is me wearing Bordering on Crochet from No 29. It was knitted in Yeoman's Panama, shade lilac, and my machine is a Brother 965i. I adjusted the length slightly but otherwise followed the pattern. 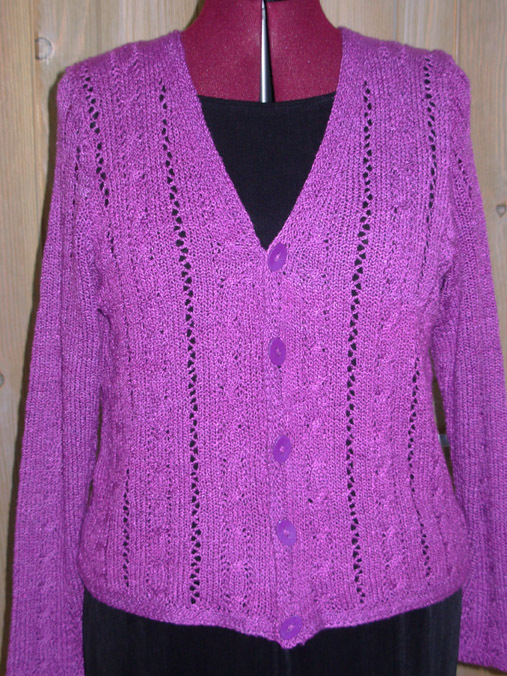 When I had finished it Elaine Cater displayed it on her stand at regional knitting shows. By the way, I don't expect you will remember me but we did meet when you came to England and visited Elaine on her stand at the Sandown Park Knitting Exhibition at Esher a few years ago. I hope this is helpful. And, though you'd used Mini Dina on a 4.5 mm, I wanted to make an outfit out of the Marbella that I've seen you use so often. However, the needles on the fine gauge Silver Reed will not handle doing lace with Marbella (broke 6) so I had to use my Passap DM80. This meant I had to hand transfer all those stitches. It wasn't difficult once I got into a rhythm. However, after 20 or so rows my hands cramped up so I stopped and made a fimo clay handle for the 3 prong transfer tool. Actually it didn't take all that long to knit, less than a month of evenings. I made the skirt from No. 20, page 48 "Fine by Me" using the SR 830 and following your pattern, then added a sleeveless shell. And voila! The perfect dress! Thanks for your magazine. Wonderful ideas always! Mary Anne, I just love your shadow pleat skirt. I told you about the long black crepe one...this latest one is 28", knit with 2 ends of Yeoman's Janeiro and 2 ends of fine acrylic. I joined it right on the machine, the seam is invisible. The top is also knit using the plating feeder Pleated Tuck Pattern No. 319 Janeiro in the back feeder, I reversed the feed at the yoke and on the short sleeves, the difference is pleasing. My garter carriage is busy knitting the adanaC sweater, (the back took 10 hours!!) Issue No. 17 is my favorite. I was waiting for the latest issue (No. 31), I needed inspiration to uncover the machine. I like all of the ponchos. Tweed Angel is No. 1. It must be lovely and soft knit in the Alpaca. Mine is Light gray Shetland and Charcoal Botany. Too small for me. On my standard gauge, I used all 200 needles at T10. I like the texture of the plating stockinette. I never thought of plating in stockinette, always used it in tuck stitch. I am going to try one using plated tuck, and I will put in an extra row between each short row to increase the length. Also thought I might try making the triangle starting with 125 needles, working from 1 needle out to 125 then back down. Do you think that would work? 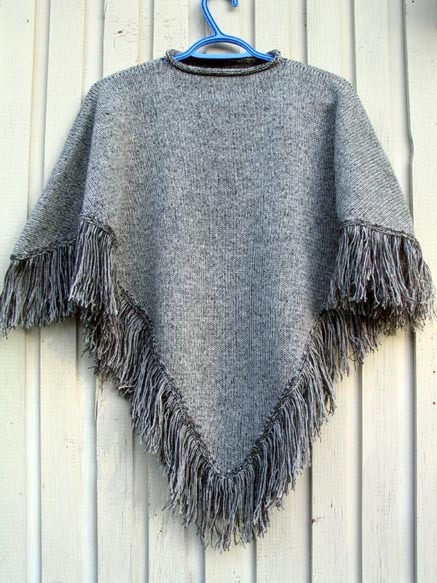 I have tons of the shetland and botany, the shetland is a bit coarse to be worn next to the skin so ponchos are ideal. I had some very nice white wool/ray, brand unkown, that I wanted to use for the Frame of Lace cardigan. I was able to get the gauge by running a strand of 2/24 with it and it knit up just grat. I know I will eget a lot of use from it for an all-purpose wrap this winter here in AZ. Thanks for all the great patterns! 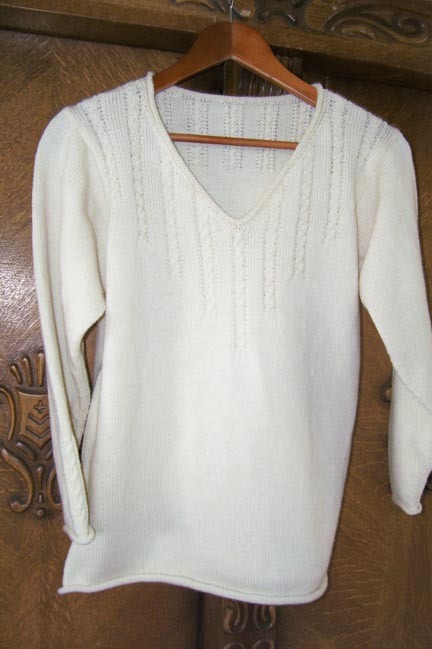 Hi Mary Ann, I saw Eileen Montgomery's Anywear sweater pattern that appeared in issue No. 33 of KNITWORDS and I said, I have to knit that for my daughter-in-law. 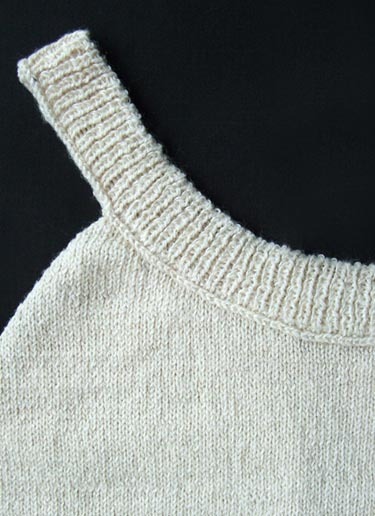 I knitted in on my 965i, and the yarn used was Yeoman's Panama in cream color. 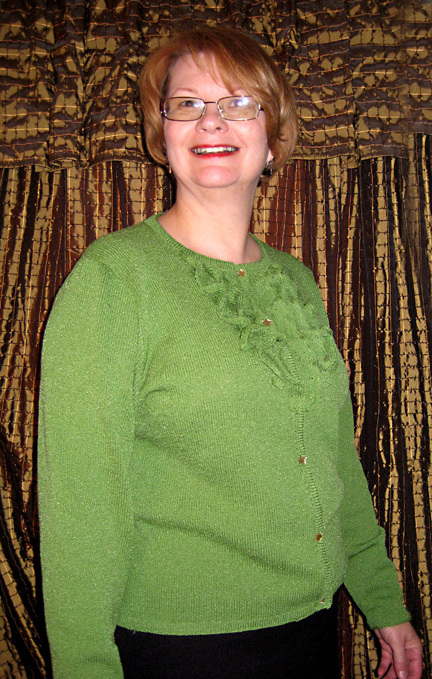 I had some problems with the neckband, but Eileen was very helpful. I have never mastered the backstitch technique on the machine that she used in the neckband pattern, so she suggested that I make a change, which I did. I knitted the band, transferred the stitches, knitted a row at garment tension, one row at highest, used the crochet castoff method, then followed the rest of her pattern. Here's a picture of Rosie in the sweater. She loved it as you can see by the smile on her face! 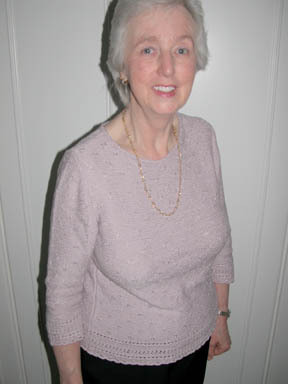 Here I am wearing my Beaded Bouquet, Eileen Montgomery's pattern from No 33. The thread lace jacket and plaited skirt are of Forsell 3-ply Superwash wool; the jacket and skirt are both knit with the addition of two strands of serger thread (threadlace and plaiting). The camisole is knit from Silk City 5/2 Perle cotton. 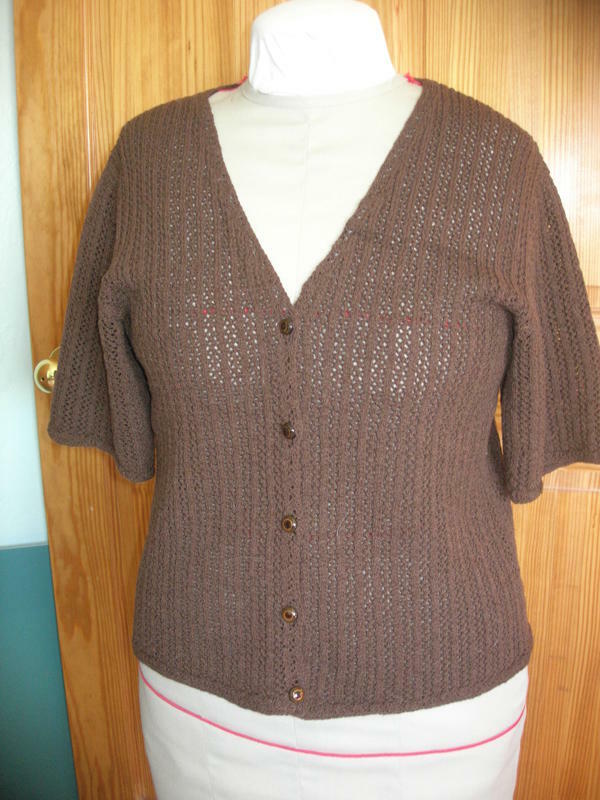 The jacket and camisole patterns are from Knitwords No 33 (Summer). The skirt pattern is my own design. Mary Anne, I am sending you two of your great patterns. The first, Double No Trouble is from issue No. 24. I love the details of this one - reversible, fully lined, the zipper, the hood and unisex - I just love it! This will definitely be a hand-me-down favorite among my many children! I brought it to my knit club for show and tell, and they all thought it was a great pattern too. They especially liked the technique you used for the zipper installation - it gave a very professional looking result. Thank you! This is Ski Bum from issue No. 27. Look how 'dressy' it looks in black and cream! 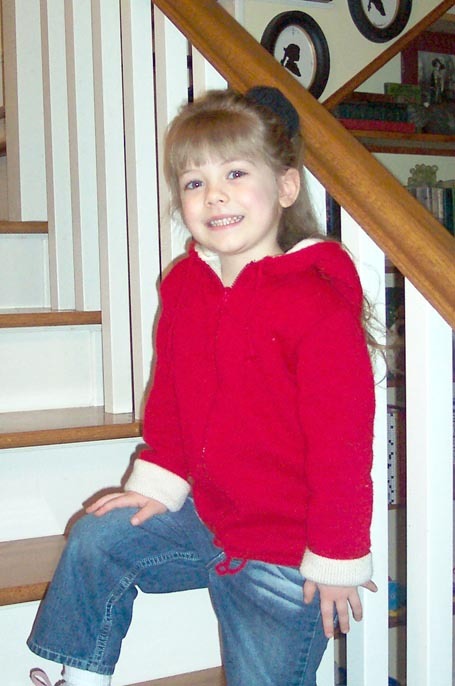 Hannah who is modeling, wanted to say that she especially loves the pouch pocket in the front. 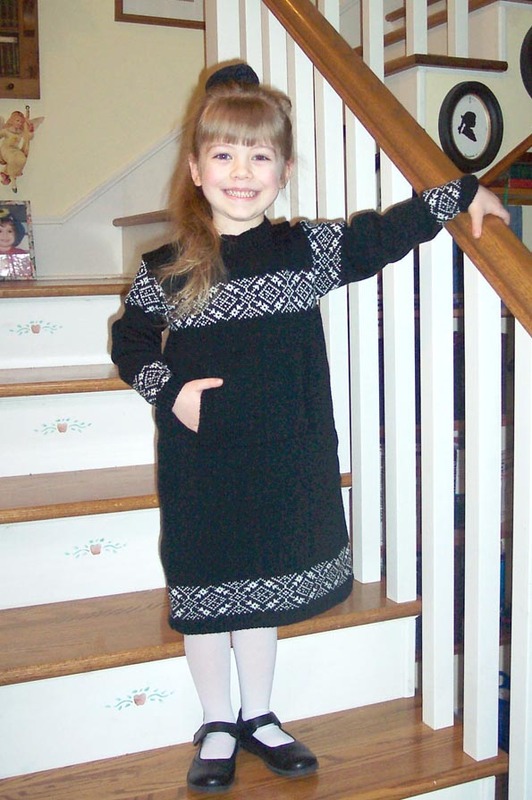 This was a really fun sweater dress to knit. As with all your patterns I have tried, it turned out picture perfect. I find your instructions very easy to follow, which makes knitting a real JOY!!! Mary Anne, I think you are great at thinking outside the box. The lightbulbs in my head just go on constantly as I read your magazine! 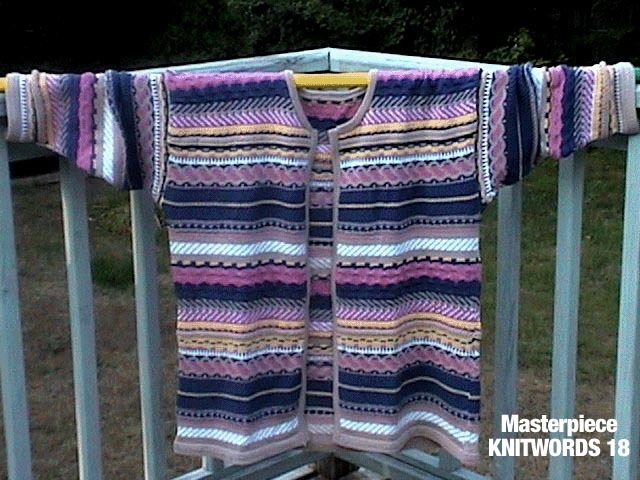 Maryanne, this is my version of issue 18's cover sweater - "Lori's Medley". It took me a year to complete it but it was worth every agonizing hour. 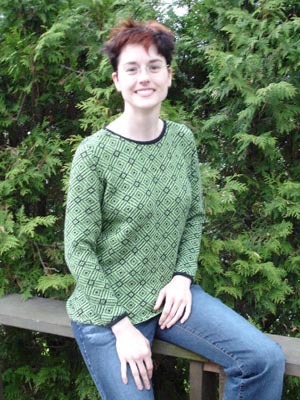 Hi Mary Anne, I finished the Triple Set & Match from Knitwords No.9, 1999. 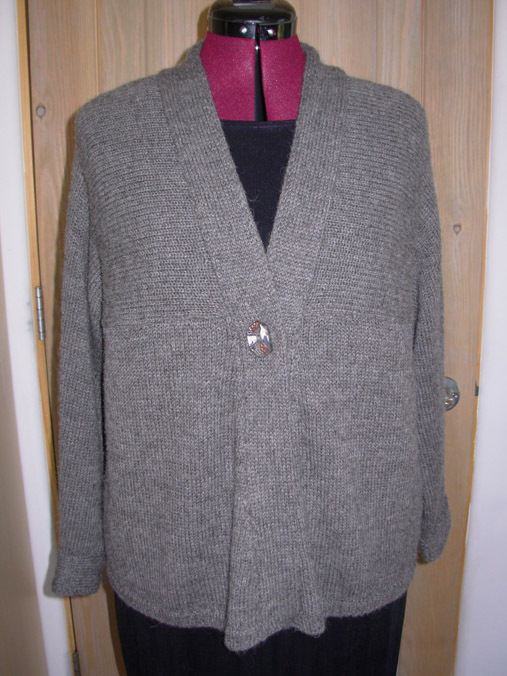 I used a circular hem for the cardigan as I wanted to have straight lines and no buttons. The great thing about the shell is that the straps are wide enough to cover the bra strap.The garment was fun to knit and I truly appreciate the fabulous fit around the armhole and shoulders. 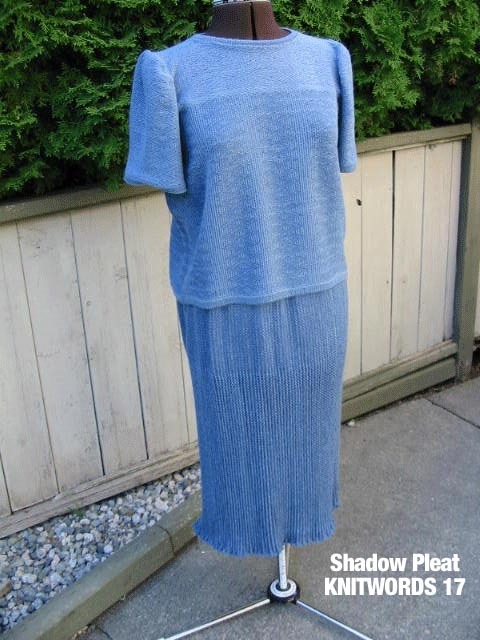 In the past I used a software program which you make your swatch and punch in the sts and rows and it will generate a pattern BUT I found that the armhole was always huge or the sleeves too tight. This pattern is wonderful and I truly recommend that all knitters take out their ribber and try it out! It is not as difficult as I thought. The easy shapes of the garment made it an enjoyable project!!! My sense of accomplishment with this set has brought my machine knitting up to another level! Many thanks Mary Anne for this awesome pattern . I love my two piece and although it's 30 Celsius I am wearing it today!!!! Hi Mary Anne, Here is my version of Margaret Heck's We Are Family from No. 31. I had to add an additional panel to go around my husband which was pretty easy to do in DAK. :) I used 6 panels altogether and 4 of the 6 I altered in some way. I used the ship and the "music in the soul" panel with no alterations. The JPB is my husband's initials and I made a USA panel by importing an eagle from another stitch design and adding the USA. I also used an all acrylic yarn (my husband and I don't care for how wool feels) and changed the colors. I didn't run into any major problems except altering the size and shape for my husband and the usual knitting machine dilemmas such as forgetting to press the fairisle button on the carriage, etc. 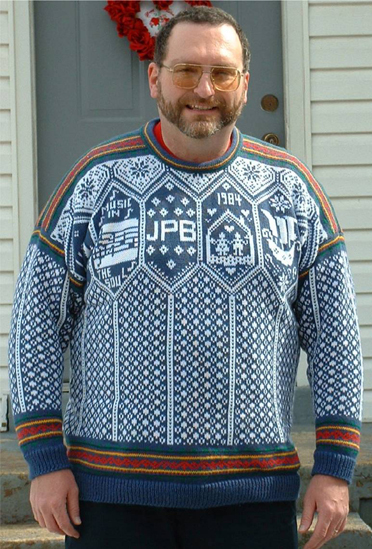 I used a Brother 940 to make the sweater and DAK of course. I used the knit from screen and it was enormously beneficial in the yarn color changes in the edging. Hi Mary Anne. The top of this outfit is Figuratively Speaking from No. 20 using Bonnie Triola's 10-cut wool-ray and adapted it to the SK830. The skirt was just a basic 4 panel flared skirt in plain knit. We had a lot of fun doing this...Iris and Jackie lined their coats...I can't decide....will let you know when we start another project. Working as a group is motivating...though we do our knitting at home. No lugging machines...We plan, talk and help each other with the planning stages, bring pieces to show... and then have lunch. It's a fun day....about twice a month. We are trying to get other knitters from the LINKG to join us. We'll see. You can view the fronts and the backs of our completed project. This is my first KNITWORDS project, but not my last. It's Margaret Heck's Patience Shawl from No. 32. "Just remember, I'm no model and my husband is no photographer. The shawl was a fun project and I am so very happy with the way it turned out. The life line idea was a god send. I used 3/11 alpaca wool blend (50/50), black. The pictures of the back did not turn out well - photographer error, no doubt! Happy knitting and thank you! Hi Mary Anne, have finished my slight variation of Dramatic Diamonds from Spring '03. Love the edges. Yeoman Panama in "leaf" & black - colour more accurate in pic where I'm wearing it. I actually blocked it with those magic wires - how conscientious! Except I did it 1/2 at a time on the ironing board - too impatient to go pick up a real blocking board. I hope I have said this before, but a big thank-you for all your help. I really love crafts & now MK has added a whole new dimension. So many new possibilities & results fast. I was afraid that I'd have to abandon knitting due to problems with my hands, but now MK allows me to "knit in gleeful spite" of that. THANKS. 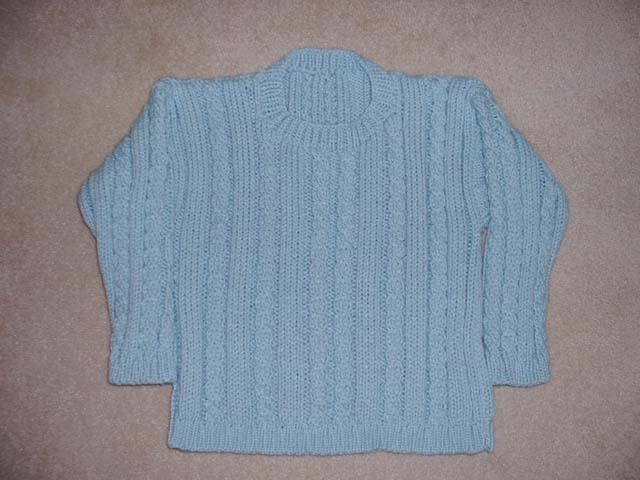 We loved the colour as it was pictured in the magazine, so I chose to knit this in ice blue. 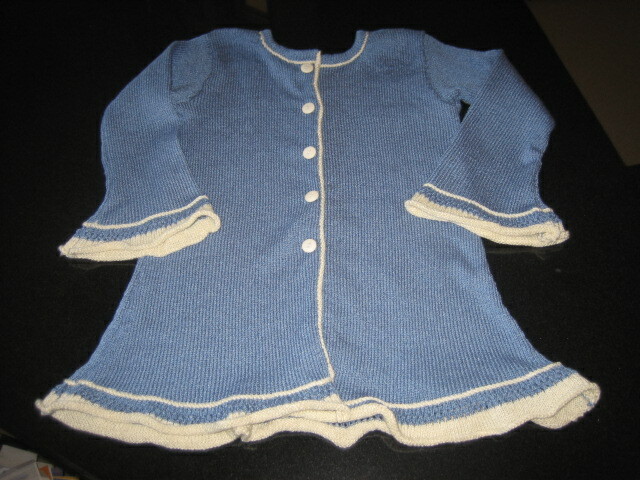 After learning the techniques for this sweater, I was able to create another sweater, 4 sizes smaller for my youngest grandaughter, using the same colour and a smaller cable pattern. I am proud of both and how they turned out. I gained a lot of experience working with the ribber and that is the beauty of your publication. It's very informative and I enjoy learning from each one. I wanted you to know that you have inspired me and look forward to my next project. So many projects, so little time! I hope you will continue to publish your magazine and your books, for many years to come. Since learning to quilt here in Nova Scotia, I have always had it in the back of my mind to incorporate some of the quilting techniques into my knitting projects. The pattern for EduCat in the fall issue of Knitwords seemed like a perfect project to combine the two. I knitted the front panel and then attached a flannelette backing with the quilt batting layered in-between. After sewing the binding all around then the fun started. 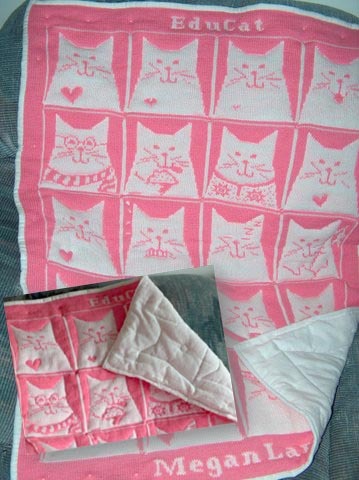 I quilted the outline of each cat as well as the hearts, ice cream cone, scarf, etc., etc. to help make these parts stand out. The blanket is soft and cuddly and, like a quilt, it has some body. 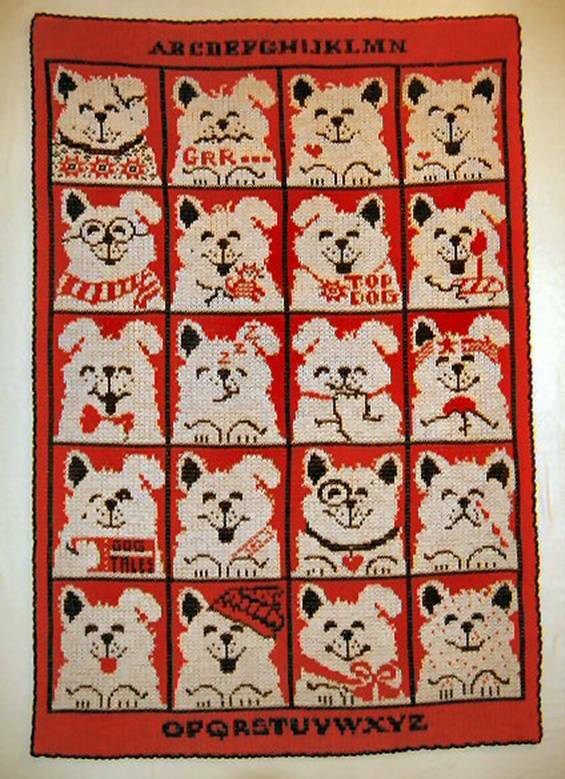 Now that the winter issue is out I see I'll have to get started on a dog quilt next. Thanks for a great magazine, Mary Anne! 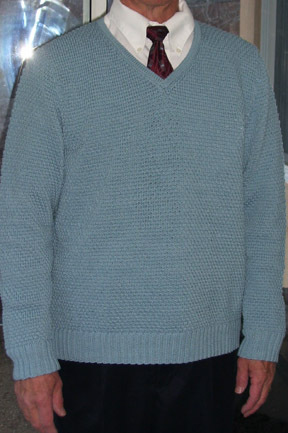 I completed the sweater and have attached a pix of me wearing it. It is for my daughter who is taller and a little heavier than I am. I knit it out of Tamm Star...not a great yarn. I have several cones I use for test purposes. I had trouble short-rowing the right hand side. So after several attempts, I decided to do a cut and sew on the whole front neckline. I picked up the neckline stitches so the seam would be inside the roll. Then I stitched the roll down. Had no trouble with the back neckline. Thanks for you help.